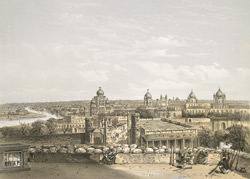 The lithograph is taken from plate 5 of 'General Views of Lucknow' by Sir DS Dodgson. This view from the roof of General Outram's headquarters shows a position captured by General Havelock's field force from rebel Indians. Havelock's battalion arrived to relieve the garrison at Lucknow on 25 September 1857. The river Gomti is pictured to the left portion of the image; the large house next to it is Dil Aram. Opposite is the Moti Mahal and the Shah Najaf. Immediately in front of the low parapet in the foreground is the Judicial Commissioner's House, an important and exposed post of the garrison, here displaying the damage from several rebel mines. Beyond it are the clock tower, the jail, the Chattar Manzil and Farhad Baksh's. The large tomb to the right is that of Saadat Khan, Nawab of Avadh; the small tomb is his mother's. Both are within the Kaiser Bagh enclosure and were held by the Indian rebels. In the distance are the large houses, La Martiniere and Khurshid Manzil.